There are many ways to create surfaces in Pilot3D, many of which start with curve entities. Those techniques will be discussed in other tutorials. 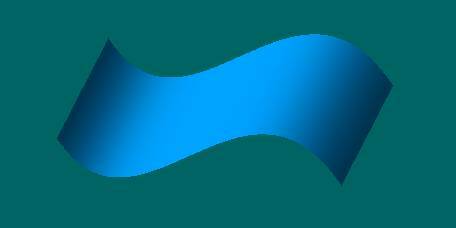 The fastest way to create a simple surface is to use the Surf-Add Surf command. When you select this command, the program expects you to pick (left click) the four corners of a very simple surface. This is just the starting point. You can add more shape and control later. First, you need a little background. NURB surfaces are defined by a grid of rows and columns of points. 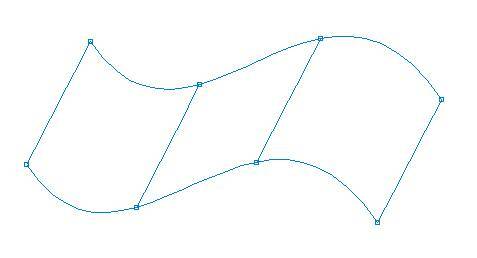 A flexible surface is defined through all of these points over the entire surface, but it’s easier to show the surface by drawing curves through the edit points that define the rows and columns of the surface. In most NURB surface programs, these edit points do NOT lie on the surface. They are called vertex points and only influence the shape of the surface. In Pilot3D, however, we have the NURB surface pass through this grid of points. This eliminates the mess of vertex points and gives you direct control over the shape of the surface. Simple surface showing two rows and 4 columns. Notice that for NURB surfaces in Pilot3D, all edit points lie on the surface. The vertex points are hidden, but can be turned on if you really need them. However, many really like Pilot3D because it allows them to edit NURB surfaces without ever seeing control vertex points. Rendered view of the same surface. When you start with the Add Surf command, you get a simple two row and two column surface. This gives you only the 4 corner edit points to define its shape. To get more edit points and shape control, you have to use one of the Surf-Add Row/Col commands. These commands allow you to add extra rows and columns into the surface. These extra rows and/or columns give you more edit points and shape control. CAUTION: NURB surfaces like to have their rows and columns evenly spaced. This isn’t a requirement, but if you put two rows or columns very close together (compared with the other rows or columns), then the surface could form a very odd shape with loops and bulges. Starting with the Add Surf command requires more knowledge than other methods like skinning, extruding, and sweeping. This command will be discussed in more detail in other tutorials. The simplest, direct approach is to use the Surf-Add Surf command to create a simple 4 corner surface. Then, you need to use one of the Surf-Add Row/Col commands to add more flexibility and control. Each time you add in a row or column, you get more control points to define its shape. Note that NURB surfaces like it if you add rows and columns in evenly spaced intervals. See the tutorial on 3D Modeling if you want to see ways to create 3D surfaces from curves or to create full 3D solids with just one command. The direct approach is to use the Edit-Move Point command to move/drag any of the edit points at the intersections of the rows and columns. You can also right-click on any edit point to set the [X,Y,Z] coordinate values. To DELETE a surface, use the Surf-Delete Surf command and left click on one of the rows or columns of the surface. Pick somewhere in the middle of the surface (if possible) because there might be another surface that shares a common edge.